There's no better way to cook a pizza than on the grill. This high, dry heat makes it the perfect pizza oven. 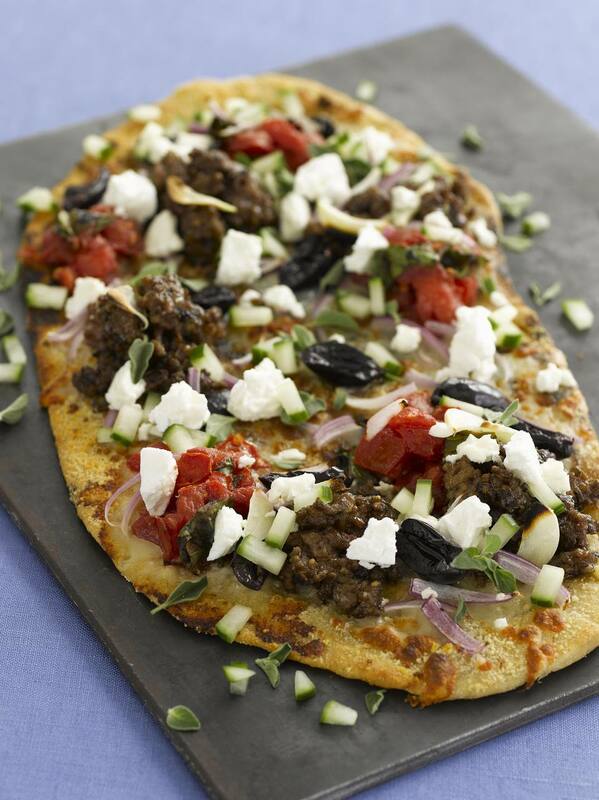 This Greek-inspired pizza is loaded with refreshing flavors and sure to make everyone happy. Combine oil, salt, and garlic together. Set aside 1 tablespoon, add dried oregano, onions and tomatoes to mixture and toss. Cover and let stand at room temperature for about 15 minutes to blend flavors. Preheat grill. Divide dough in half and roll each half into 8-inch circles on a floured surface. Carefully place crusts on hot grill and heat for about 1 to 2 minutes or until they begin to brown. Remove crusts from the grill. Place browned side up and brush with the reserved olive oil mixture. Top with tomato mixture, cheeses and olives. Carefully return pizza to grill. This is easier if you use a cookie sheet to carry the pizzas. Close lid and continue grilling for about 2 to 4 minutes or until the bottom has browned and cheese is melted. Watch closely to ensure that the pizza crust does not burn. Serve.